The act of playing soccer is so impressive because it involves 11 individuals combining their very specific and often disparate skills to create a amoeba-like whole that can progress a ball up and down a large field and into a goal using only its 22 feet while a competing body tries to stand in its way. What makes the game fair is that, over the course of a long enough timespan, the tiny talent margins that separate individual players (after all, the distance between Brek Shea and Lionel Messi is microscopic compared to the distance between Brek Shea and me) all add up in a way that tends to award victory to the better team. But the reason why soccer can be so thrilling that it makes you want to puke is because two exceptional teams of almost equal talent can take to the pitch and give it their all for 90 minutes, and the only thing separating what feels like heart-bursting victory and world-ending defeat is literally a couple of centimeters. Manchester City beat Liverpool yesterday by a score of 2-1 in a match determined more by luck and randomness than by any discernible gap in performance or ability. It was the biggest match of the season and arguably the biggest mid-season game in a generation. Liverpool came into it with a seven point lead over City in the table. A win for the Reds would’ve extended the gap to ten points, which, seeing as the Pool Boys had only dropped six points all season before yesterday, would’ve been a practically insurmountable advantage; a win for the Sky Blues would’ve cut it to four and in doing so ensured that the race for the title would be right back on and likely to last at a nail-gnashing pace for the season’s entirety. I couldn’t tell you whether or not City are better than Liverpool after yesterday’s match, nor would I feel too confident making either team favorites by any significant margin to go on to win the Premier League title. But what I can say after that game is that two extremely good teams put on an exhibition of technical skill and tactical sophistication, with a passion and intensity that made the match itself feel every bit as seismically important as it seemed to be coming in, and that it remains a wonder that such a huge match played at the highest level can turn on such minute details. To say that fortune played a prominent role in the match’s outcome isn’t to detract from City’s victory or the quality of either team’s performance. It’s quite the opposite, actually. It’s because both City and Liverpool played such outstanding soccer for the entire match, and because these two teams as currently constructed are pretty much perfect equals, that the only things that could separate them were the spin of the grass and the whims of the universe. In a game that meant everything to both teams, there was practically nothing that really separated them. Both teams came in with great game plans. Both teams excelled at different aspects of the game, be it when creating quick chances on the counter or doing so with intricate passing sequences or pressing ferociously when out of possession or when forming a deep defensive wall that withstood the onslaught of some of the most fearsome forwards in the world. Almost every player had a good game, and every single one of them played his heart out. And yet in spite of that overarching equality, City managed to get more of those crucial lucky breaks than Liverpool and came away with the win that gave new life to their title dream. Both teams will probably feel pretty optimistic about their chances of finishing the season as champions after that game. Liverpool have to be ruing the missed opportunity, since a victory yesterday would’ve handed them a 10 point lead that would’ve felt insurmountable for a squad that had only dropped six points all year prior to the City game, but the strength and versatility they demonstrated, in an away match the hosts absolutely had to win, no less, should prove once and for all that they can play whoever, whenever, and however and do it well enough to win. For City, it would be hard to overstate how huge a win that was. It’s probably the single biggest victory of the Pep Guardiola era. A loss would’ve essentially ended the title race and would’ve invited an enormous storm of doubt and criticism from the public about the state of the club. The win cut City’s deficit to just four points, and could very well prove the turning point on a season that started so promisingly but has since sputtered out of control. Such titanic stakes, and only a couple lucky bounces separating glory and hope from agony and depression. What’s maybe most crazy about the impossibly narrow margins between victory and defeat in yesterday’s game is how they are only a smidge smaller than the margins that will probably end up determining the title. While there is still an entire half of the season remaining in the league, Liverpool and Man City are machines at rattling off wins. Either team could run the table from here on out and it would shock no one. Absent a couple big injuries or transfer additions, the title race seems destined to continue into final few weeks of the season as each team racks up wins and goals at a blistering pace in hopes of snatching up those one or two points that will make all the difference. 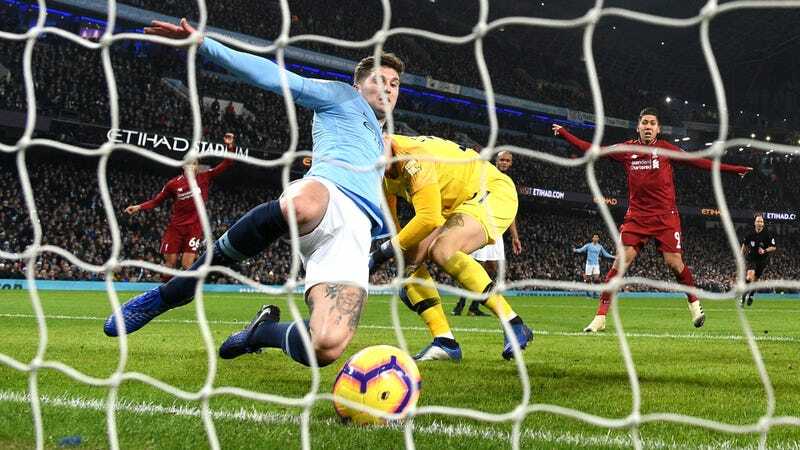 A lucky bounce here and a missed penalty there, an inexplicable goalkeeping error one day and a late-game screamer the next—these are the kinds of things that look most likely to determine whether City become the first team to defend the title in a decade or if Liverpool win their first league trophy in almost 30 years. It’s the best, tightest title race in ages, where every game is a must win and every loss could be fatal, and it’s only just getting started. How Is Christian Pulisic Going To Fit In At Chelsea?